DVD Synopsis: Director Howard Hawks, who worked brilliantly in practically every movie genre, shows his mastery of the large-scale epic with this gigantic production filmed on location in Egypt. Thousands of extras (9,787 in one scene alone! ), magnificently detailed sets (including the pyramid's inner labyrinth, booby-trapped so no one can learn its secrets and live) and vast desert vistas fill the screen and astonish the eye. There are also human-scale stories. Of the Pharaoh (Jack Hawkins) who orders the pyramid as his tomb, dooming untold numbers to unending toil. Of the architect (James Robertson Justice) designing it to earn his people's freedom. Of the slaves constructing it of blood and sinew. And of a beautiful queen (Joan Collins) whose greed leads to murder – and a stunning revenge! Land of the Pharaohs is the kind of film Hollywood excelled in during the 1950’s and 60’s; a big, sweeping epic in which countless historical inaccuracies are hidden behind grand spectacle. 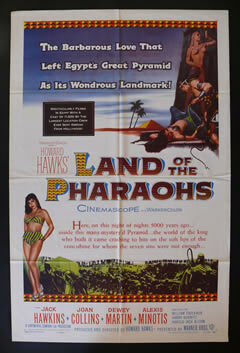 Directed by the legendary Howard Hawks, Land of the Pharaohs has several things going for it. For starters, this is one of the few epics from this era that doesn’t assume “historical” is synonymous with “biblical”. With a setting thousands of years before the onset of Christianity, Land of the Pharaohs avoids the pontification and air of self-importance that plagued so many other studio epics. But more than this, the film tells one hell of a story, the building of the Great Pyramid of Giza! Doubtless the filmmakers get a lot of the details wrong, but there’s no denying that this is magnificent subject matter. Overall, I’d say Land of the Pharaohs is a big, boisterous movie that gets bogged down halfway through by the inclusion of a trite love triangle, but with such a grand story to tell, and so many great sets and locations to tell it on, Land of the Pharaohs proves a real treat for the eyes, even if it isn’t exactly stimulating for the mind.